The so-called lye or alkalic pastries - “Laugengebäck” - are popular in various forms in the Alpine region and especially in Bavaria. 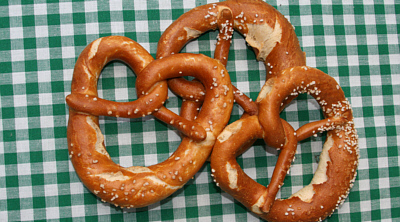 The most famous is probably the Breze, pretzel, or even Brezl and Pretzel. While the small crispy variant already made people choke, a real Laugenbreze is downy and simply delicious. The secret of the dark brown pastry is the lye - a caustic soda where the firmed dough of the Breze ist put into before baking and which causes crispy brown skin. Mix ingredients well (if you use real yeast disolve it in water first). Cut the dough into 6 parts. form long rolls that are about 60cm long, the should be thicker in the middle than on the outside, form a circle about the size of a palm, twist the lose ends once and fold it down - and you should have the typical Brezen form. Cover your Brezels with a cloth and leave for 30 minuate at a warm place (to start the processing of the yeast). Meanwhile, prepare the caustic soda to: put soda powder into the water and boil, then leave the fluid on medium temperature. Then take the Brezen with tongs or alike and put them shortly into the fluid. Put the Brezen on a baking sheet and sprinkel them with coarse salt. Leave them in pthe reheated oven at 200 ° C for about 20 minutes. After putting them into the lye, the Brezen should be put as quickly as possible into the oven, so that they can develop the delicious brown crust. The dipping into the caustic soda works best when you freeze the Brezen after rising, and dip the frozen Brezel into the fluid. They are not deformed and the lye does not penetrate the dough. The frozen Brezen can also be kept well for a while and only when necessary let them dive into the lye, bake and enjoy. Instead of salt you can sprinkle the Brezels withe sesame, poppy sead or cheese. In Munich Bavarians enjoy the Laugenbreze like a piece of bread covered with sausage and cheese or coated with butter. In other places it is welcome for “Brotzeit” (snack). Do you know how to share a Breze: each one takes the half of the Brezen with two fingers and then pull. Exceptional opal necklace, art nouveau style"